Faculty Show — Once every four years, faculty and staff get together to write and perform a variety show. It is hilarious every time, but since one was held in 2017, you’ll have to wait a few years to find out what the talk is all about! Founders’ Day — A longstanding College tradition, Founders’ Day is usually held at the end of September. Seniors wear their graduation robes for the first time, while all other students dress in black and white. Students, faculty and staff walk up Monument Hill to pay respect to the founding family, and each senior is accompanied by one or two underclasswomen. Each student leaves a daisy on Daisy’s grave. Opening Convocation — Every year in August, Sweet Briar holds a convocation to mark the official start of the academic year. Opening Convocation is usually followed by ice cream. Big Sister/Little Sister — Just after arriving on campus, each first-year has the chance to meet with a junior assigned to her as a Big sister. Big sisters are supposed to help their little sisters acclimate to college life and answer any questions the first-year may have about Sweet Briar. Class Ring — The Sweet Briar class ring is a pinky ring worn on the left hand. Engraved on the ring is the Sweet Briar seal. Once a Sweet Briar woman is engaged or married, she switches it to her right hand. While at Sweet Briar, the student wears the ring with the chapel pointing towards her heart. Once away from Sweet Briar, the graduate turns the ring around so the chapel is pointing away from her. The color of the stone in the ring is determined by class color. Freshman Caroling — In December, first-years gather to sing their way up and down Faculty Row. Freshman Hitching Post — The hitching post located next to the bell tower is defended by the first-years during the rock and hitching post fight. It is periodically painted by campus organizations. Freshman Show — In the spring, the first-years put on a sketch comedy show for the Aint’s ‘n’ Asses. Hanging of the Banners — At the beginning of each year, a ceremony is held in the Fitness and Athletic Center in which the banner for the senior class is moved over the fireplace and the banner for the incoming first-year class is displayed for the first time in its location by the doors. Here’s to (insert name), Holla, holla, holla, nothing that you cannot do. Work for the good and work for the right, always doing something and doing it right. So here’s to (insert name) Holla, holla, holla, nothing that you cannot do. Junior Banquet — At Junior Banquet, juniors receive their class rings and their senior robes. Each junior has a friend write an ode in her honor, and these are read at the banquet. Junior Bench — Only juniors are allowed to use the semi-circular bench located between Randolph Residence Hall and Memorial Chapel. Junior Week — During Junior Week, juniors dress up each day in varying costumes dictated by an unknown senior, who will later give her senior robe to the chosen junior. The senior reveals her identity at Junior Banquet, the culmination of Junior Week. Lantern Bearing — Near the end of the year, seniors ask an underclasswoman to make a “lantern” for her. The students gather, seniors wearing their graduation robes and underclasswomen in white. To represent the four years the seniors spent at Sweet Briar, everyone walks around the quad four times. 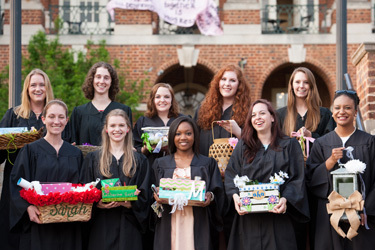 The seniors then sit on the Senior Steps while the underclasswomen line the pathway and sing to the seniors, marking the final tradition the seniors participate in at Sweet Briar. Ring Game — To announce the engagement of a member of the senior class, the class president calls the seniors together to play the Ring Game. Everyone gathers in a circle, each holding on to a long piece of string. The engagement ring is put onto the string and passed around the circle three times. On the third pass around the circle, the newly engaged woman puts on the ring, informing the class of her engagement. Rock and Hitching Post Fight — In a fight to create a mess of the landmark of the other class, first-years defend the hitching post and sophomores defend the rock. At the end of the fight, the juniors determine the winner (usually the first-years) by the amount of paint worn by each class. Scream Night — On the night before exams begin, everyone gathers in the quad to let out their stress in a scream as the bells chime 10 p.m., as well as pick up some study snacks. Scroll Game — A variation on the ring game, the scroll game is played to announce one’s acceptance into grad school. A paper scroll is substituted for the ring. Secret Sophomores — Throughout the year, seniors receive gifts from an unknown sophomore and leave gifts for their secret sophomore in the Prothro commons or at the senior’s door. At the end of the year, the seniors find out who their secret sophomore is during a senior class/sophomore class party. Senior Doors — The center doors to the main Prothro dining hall are for seniors only. Senior Robes — In addition to the robes worn at graduation, seniors also have decorated robes that are passed down each year. Each first-year is assigned a senior and is expected to add more decorations to that senior’s robe. Seniors wear these robes once a month on the day of the month that their graduation will occur in May. The junior has to “earn” her new robe during Junior Week. When she receives the robe, it usually contains an interior pocket filled with her favorite candy. Senior Steps — Seniors sit on the front steps to Pannell during Step Singing. 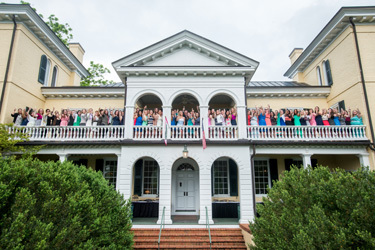 Senior Toast — Seniors are invited to Sweet Briar House for a champagne toast with the College president as part of commencement activities. Sophomore Bonding Experience — Participating in the Sophomore Bonding Experience are new sophomore QV members and sophomores who want to become Bum Chums. The activities of the Sophomore Bonding Experience are a secret, although you’ll find out more at the end of spring semester when the QVs and the Bum Chums hold joint information sessions to help first-years decide if they want to participate during the following year. Sophomore Rock — Next to the Freshman Hitching Post is the Sophomore Rock, which is defended by the sophomores during the Rock and Hitching Post Fight. It is often painted by campus organizations, in matching colors to the hitching post. Step Singing — The classes gather together, and each class sings a teasing or admiring song for each of the other classes and one bragging song of themselves.